*Please access nl.transcend-info.com/Support/Warranty.asp for more information about Transcend Warranty Policy. **All brand names are registered trademarks of their respective owners. Specifications subject to change without notice. Please see Transcend website for warranty details and limitations. Products : Good times always fly by in a blink. 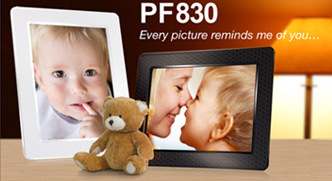 Here, seize every precious moment and make it everlasting with the PF830 digital photo frame. With its 8-inch high-resolution screen, you can show off your treasured photos with the same crisp detail and rich color as high-quality prints! The PF830 has up to 4GB of internal memory and is fully compatible with SD, SDHC, CF, MMC and MS types of popular memory cards. Just plug in your memory card from digital camera before you hit the play button for an instant display. With a bright photo-friendly 4:3 screen, multiple color modes, plus an automatic rotation sensor, the PF830 is the must-have companion to keep all those important moments alive!